Waking up at five in the morning, saying our prayers, we go to church. KOCHI: The life of isolation continues for the five nuns - Sr Anupama, Sr Alfi, Sr Neena Rose, Sr Ancita and Sr Josephine - of the Missionaries of Jesus congregation who had staged a protest for 15 days, demanding the arrest of former Jalandhar Bishop Franco Mulakkal at Vanji Square, near High Court Junction in Kochi. In a first, as the result of the protest, Franco was arrested and the first phase of the protest launched by the Save Our Sisters (SOS) Action Council came to an end. But, the struggle of the nuns still continues. St Francis Mission House, Kuravilangad, the convent where the six nuns, including the victim, are residing has become a home of grief. “The life here at the convent is no longer the same as we used to have earlier. The rest of the four sisters staying here see us as wrongdoers,” said one among the five nuns. Waking up at five in the morning, saying our prayers, we go to church. Only Sr Alfi and Sr Neena Rose go for the morning service in the church outside the convent. The rest of the three sisters remain at the convent in order to avoid glances and questions from the public. “We pray at the chapel inside the convent. The sisters who go to church try to keep away from society,” she said. The rest of the nuns in and out of the Catholic Church and believers wholeheartedly support us, but they fear to come out, she said. Though the 10 nuns stay under the same roof at St Francis Mission House, their life continues to be in seclusion. “Nothing seems to be common. The four sisters, including the sisters who have joined our convent recently, stand against us. They do not communicate with us. We do not dine together. They have their food either before or after we have ours,” she said. Ultimate justice will be served only once Franco gets punishment. Though he is behind bars, the victim fears every day he might get away without punishment. “Since he has money and power, witnesses and evidence can be destroyed, but we have faith in our law system. Truth is on our side, therefore we do not have fear,” said one of the five nuns. 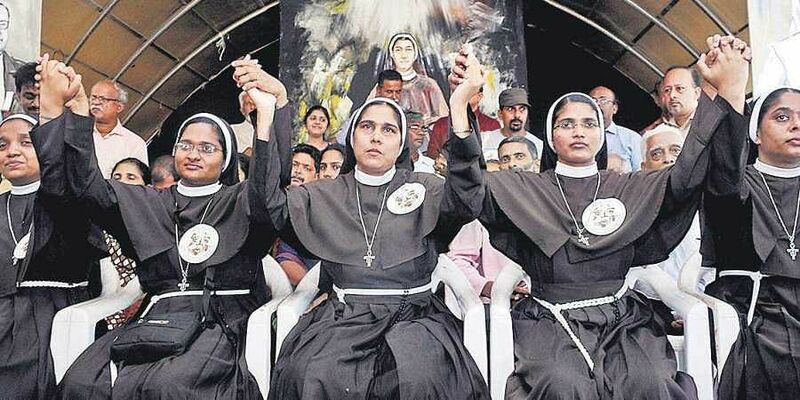 The nuns are criticised for staying at the convent illegally by Changanassery-based Catholic Federation of India. “The move of the federation is pre-planned. Transferring us is the only way left for them to torture us. But we will not yield to it. Even Sr Anita, who supported us before the probe, joined the rest of them who are against us. The Church is targetting us slowly,” she said.